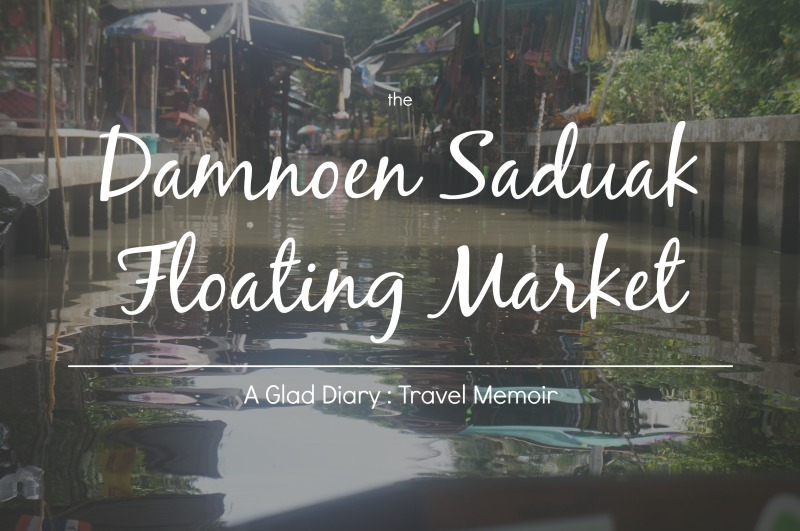 So our next stop is at Damnoen Saduak floating market. It took us around 30 minutes from Maeklong Railway Market. If you've read my previous post then you will know that for this tour we use Rat Service. 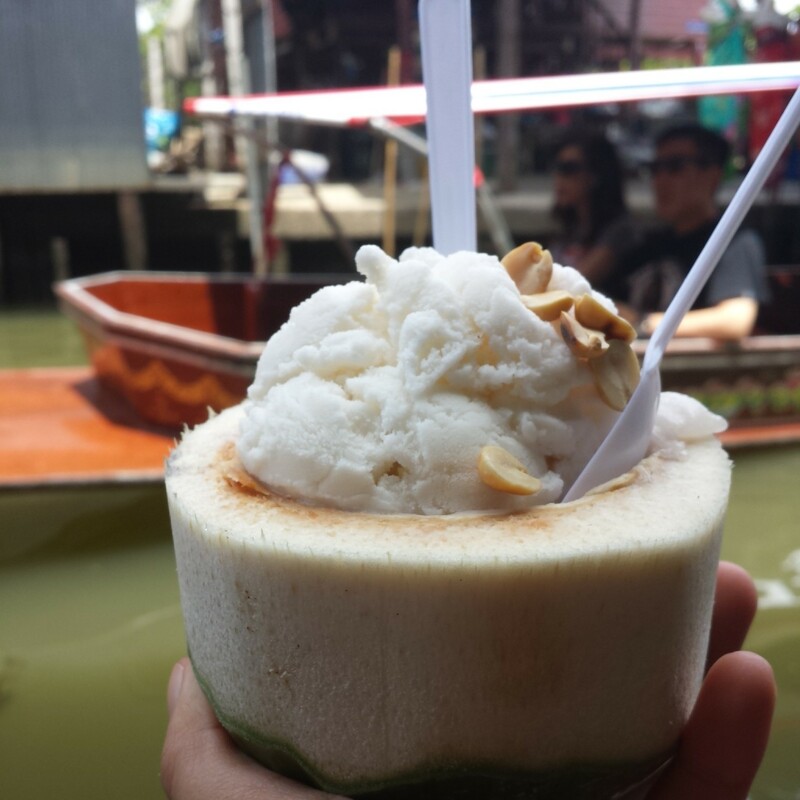 When we arrived we we're welcomed with cold and fresh coconut water which I find very refreshing since it was super duper hot at Maeklong Railway market. I felt that my sweat is dripping just like a malfunction faucet. Yeah, that's how hot it is. Rat then ushered us to the long tail boat. And so we started to sightsee around the area. I was so thankful we took the long tail boat instead of the paddleboat because the operator can just speed off anytime it's clear. It creates cool breezes like an electric fan which counteracts the heat and the high humidity. On our way, we noticed houses at the side of the canal. Rat asked us if we wanted to stop at the Coconut Sugar Farm but we opt not too because we're sitting comfortable enough at our seats at the long tail boat. So we're finally entering the floating market. Thailand is famous for mango sticky rice and so we didn't let this moment pass without buying it at it's homeland. And boy! It was way too good than buying it outside the country. The sticky rice cost 50 THB. 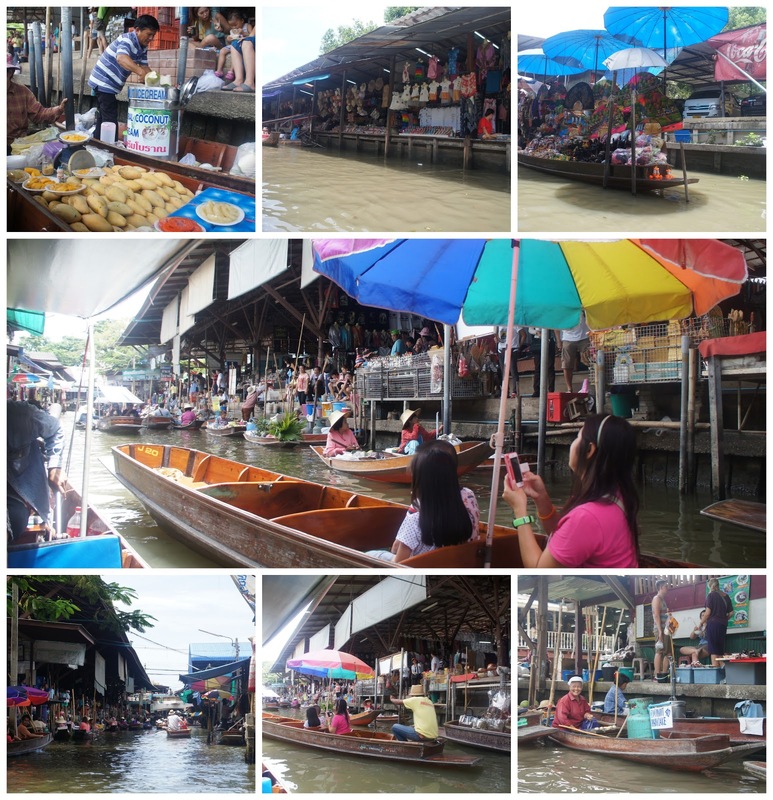 It was so fun seeing other tourist eating a local dish at a moving long tail boat or a rowing paddleboat; people who are buying, selling, giving free taste and haggling; and tour guides or locals interacting with tourists. We even saw an old lady washing her spoon in the water at the floating market and an old man taking a dip near his home. We we're like is the water clean? Or perhaps we misjudged it because it looked brown and murky. And so we've arrived at the end. One thing I've noticed at this market is that some female vendors and yes even auntie's (term for an old lady in Asia) wears make up. I mean it's hot and humid and make up tends to cake and melt under these weather conditions. My friend told us that in Myanmar women applies make up because they believe that it will help combat the heat. Perhaps it's also the same? The truth is, this sight really fascinates me. Other than the floating market Rat also toured us at at temple at the side of the canal with a bunch of hungry fishes. We didn't alight at our boat to see the temple but instead stayed and feed the fishes. The man working at the temple??? (I'm not sure) handed us 3 packs of fish food (one for me, my husband and my friend) to feed them. I tell you they we're on a feeding frenzy. Ahahaha!! You might want to check out the video I've made during our tour at Damnoen Saduak. Have you seen the big spiders at the posts towards the end? That's a lot of them and they we're pretty big. For food, they eat trapped birds at their web. If you wanted to stay longer at the area you can booked a room stay located at the side of the canal. Before we begin our tour around the floating market, people working around the area took a photo of us and put it into wooden photo frame for souvenirs which cost 200 THB per souvenir but we haggled it for 150 THB each. Yes, in Thailand it's normal to haggle. As I've mentioned from my previous post, I would highly recommend Rat Service tour as a tour service of choice when you visit Thailand. Contact her at this email == rat_bkk@hotmail.com. It's nice that they still managed to preserve the river's sanitation and beauty, despite being heavily occupied by vendors and tourists (not to mention the huge amount of waste and trash humans always seem to produce wherever they go ;-)). By the way, did you at least bring any goodies for your friends/officemates back in Singapore??! Aahh you got back memories from my Thailand trip ! Awesome post.